// Home Oxygen: Who Needs it and Why? Home Oxygen: Who Needs it and Why? If you’ve been evaluated by your physician and she’s determined you need home oxygen therapy, the Inogen At Home may be just what the doctor ordered. But who benefits most from home oxygen therapy and why choose the Inogen At Home? Let’s explore this further. Oxygen is a colorless, tasteless, odorless gas and without it, life would not be possible. The air we breathe contains 21% oxygen that when inhaled, flows through our nose to our windpipe and into our lungs. Once in the lungs it passes into the bloodstream where it is carried by red blood cells to all the tissues and organs of our body. Oxygen is needed for metabolism: the conversion of the food we eat into heat and energy. Who Needs Oxygen Therapy and Why? Patients with a resting partial pressure of oxygen (PaO2) (as measured by an arterial blood gas study) of < 55 mmHg, with an oxygen saturation level of < 88%. Patients whose PaO2 is 55-59 mmHg, with a corresponding oxygen saturation level of 89%, who exhibit signs of tissue hypoxia (lack of oxygen to the body tissues), including those with pulmonary hypertension (high blood pressure in the lungs), cor pulmonale (right sided heart failure), polycythemia (increased red blood cell production), fluid retention from right heart failure, or impaired mental status. How is Oxygen Therapy Supplied? Liquid Oxygen – air is cooled and compressed until it becomes liquid oxygen. It’s then stored in thermos-type bottles known as reservoirs. There is usually a home base unit where the bulk of the liquid oxygen is stored and smaller tanks that can be used around the home and for travel. Compressed Gas – oxygen is compressed and stored in heavy steel or aluminum pressurized oxygen tanks. It is then delivered to your home. 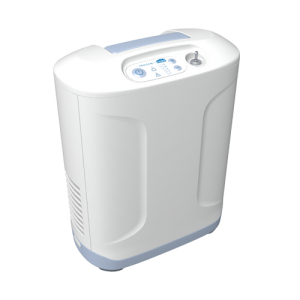 Oxygen Concentrator – regular room air is pumped through a fine filter inside a medical device called an oxygen concentrator. The concentrator converts normal air to almost pure oxygen by passing it through the filter and then it is inhaled by the user. This method is less expensive and easier to maintain. Increases mental alertness and stamina. Allows for normal body functioning. Prevents heart failure in people with severe lung disease. Improves ability to exercise for longer periods of time at higher intensities. In addition, oxygen therapy prolongs survival for some patients who use is at least 15 hours a day. Why Choose the Inogen At Home? At only 18 pounds and 16.5 inches high, the Inogen At Home is one of the lightest, quietest, most energy-efficient 5 liter home oxygen concentrators on the market today. Compared to other home oxygen concentrators, the Inogen At Home is half the size and far more efficient. In fact, it can literally pay for itself in the long run by saving you money on your electricity bill. Check out our energy savings calculator to see how much you can save by choosing a more energy efficient home oxygen concentrator like the Inogen At Home. American Thoracic Society. “Appropriate Candidates for Long-Term Oxygen Therapy.” Updated 2015. American Lung Association. “Supplemental Oxygen”. Accessed 8/2/2015. 3 Emtner, Margaret et. al. Benefits of Supplemental Oxygen in Exercise Training in Nonhypoxemic Chronic Obstructive Pulmonary Disease Patients. American Journal of Respiratory and Critical Care Medicine, Vol. 168, No. 9 (2003), pp. 1034-1042. doi: 10.1164/rccm.200212-1525OC. 4 Croxton, Thomas L., et. al. “Long-term Oxygen Treatment in Chronic Obstructive Pulmonary Disease: Recommendations for Future Research.” American Journal of Respiratory and Critical Care Medicine Vol 174. pp. 373-378, 2006.